The hubs and I celebrated our fourth anniversary over Memorial Day weekend. We are a sucker for tradition and stick to the classic list of anniversary gifts. Each year it has been fun to come up with something clever to give one another. We’ve conquered paper, cotton, leather and this year fruit or flowers. While I may beam from a dozen roses, surprising my husband with a basket of fruit or homemade jam just didn’t seem good enough. Therefore, we decided to go in on our gift together. 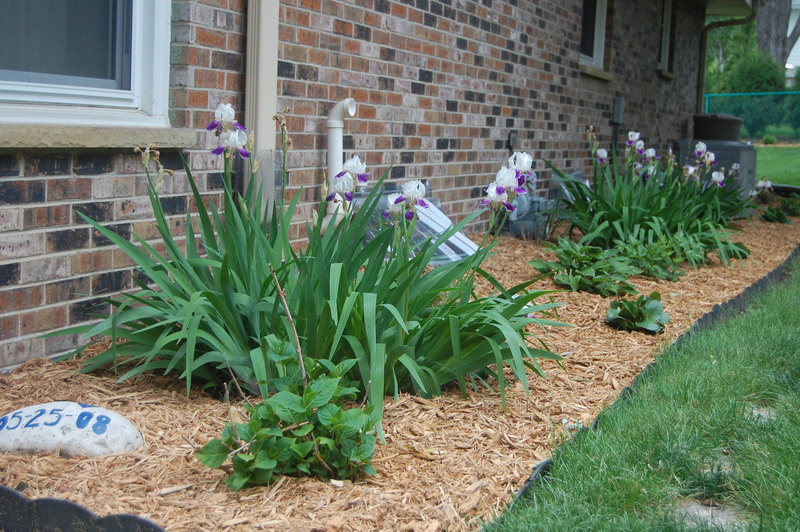 If you remember last year, I talked about planting a shade garden. 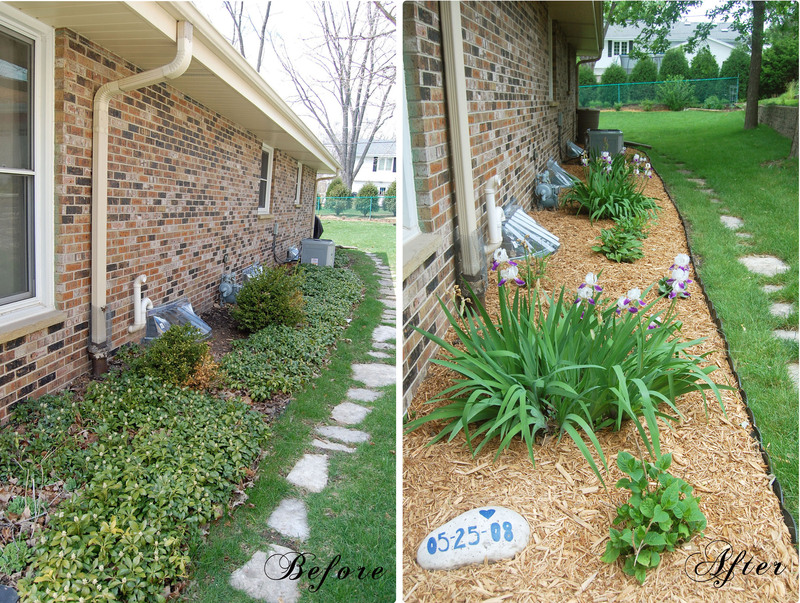 We worked on ripping up the old ground cover from the side of the house and took out some shrubs. By the time I was motivated to plant, it was too late in the season. This year, we gave each other the gift of beautiful landscaping and had fun picking out flowers and sprucing up the side walkway of our house. 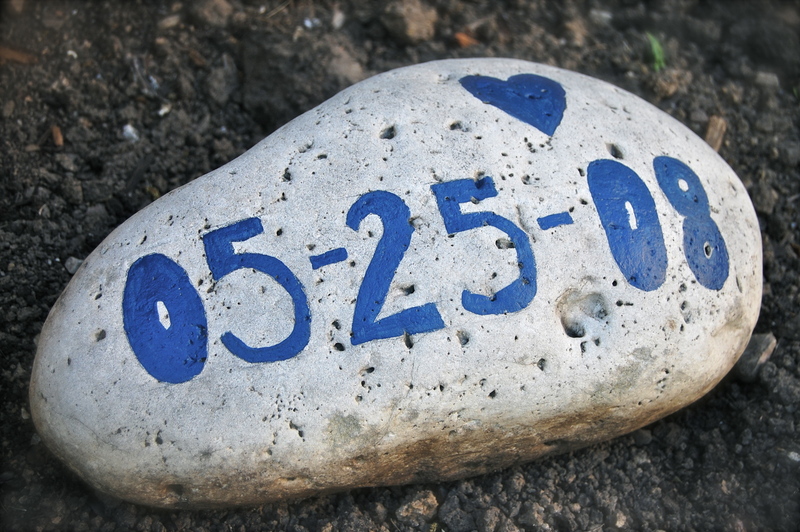 To dedicate the shade garden, I painted a rock I found in our yard with our anniversary date. I freehanded the letters in pencil and painted them in with some leftover paint I had laying around the house. Now, as we walk past our pretty flowers, we both feel a little extra love. I researched the best flowers to grow with little sunlight in Wisconsin. We already have bunches of purple daylilies whose blooms we have been enjoying lately. We have also mixed in a few varieties of hostsas. I wanted to add some color at other parts of the season, so I added some astilbes and coral bells to the mix to brighten it up. While you may not be able to see them yet, I also placed Northern Sea Oats to give some height and depth to the garden. We fixed up the edging and added some cypress mulch. We couldn’t be happier with the transformation! I will share more pictures with you later in the season and next year, when our small plants blossom and bloom! Do you stick with the traditional anniversary gifts? If so, I’d love to hear your clever ideas!